A new report from Publisher's Weekly reports that the graphic novel category was off 5% in units in stores and at online retailers reporting to Bookscan in 2017, as compared with a 11% increase in 2016. The category saw a drop from 11.94 to 11.33 million copies moved. The Bookscan total requires some massaging, as always: it contains a number of prose books with cartoon illustrations which even under a generous definition wouldn't be called comics, and as Heidi MacDonald notes, children's graphic novels are not included in the count. (Update: ICV2 reports that Bookscan has shared that kids' graphic novels were up 1.9%, which is good news.) But Bookscan easily represents the largest portion of the book channel outside the Direct Market, and its stats are helpful in figuring out the bigger picture. The mix of titles which sell well in the bookstore market differs from what we see in the Diamond Comic Distributors charts; Raina Telgemeier's books usually dominate the list, but there wasn't a new one in 2017, and that undoubtedly plays into the decrease. We don't usually focus on graphic novel units, because the prices for them vary so widely— but what we see here generally fits the contours of events in the business. In 2011, graphic novel sales suffered comparatively against 2010, when a lot of low-cover-price Walking Dead and Scott Pilgrim volumes were in the mix. 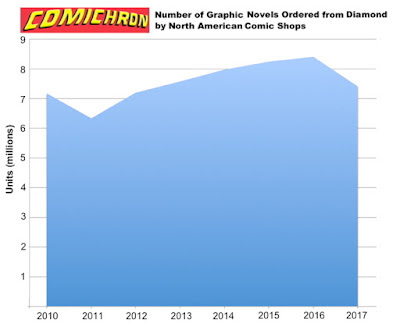 Meanwhile, graphic novels saw an abrupt recovery that began following DC's "New 52" in 2011 and which continued up until 2017's Direct Market slowdown, which struck every print format. So the comics shop market ordered 1 million fewer graphic novel units last year versus 2016, even as Bookscan saw a drop in its reporting outlets of 610,000 copies. I suspect the 5% drop at Bookscan may work out to closer to 4% in dollars, if we consider that the typical GN bought at a comics shop is pricier; regardless, we should ultimately see that the overall sales for the overall comics industry is off in the high single digits rather than the 10% the Direct Market was. Graphic novel shipments to the Direct Market still beat those of 2011 by more than a million copies, and what's remarkable is that the range for the category over this decade has been relatively confined, within a two-million copy range. Something the data may put to rest is the talk of there being a channel shift taking place, with graphic novel buyers leaving comics shops for non-Direct Market channels. Extraordinary claims require extraordinary evidence, as Carl Sagan said, and here, really strong evidence would have been the book chains and Amazon having a wildly better year than the comics shops. That didn't happen. That theory never fully accounted for the possibility that comics shops might themselves have been ordering the same number of graphic novels, but just not from Diamond, which could well explain a portion of any Diamond/book channel gap.